In late September, Ottawa had the honour of hosting the One Young World Summit: an international conference that brings together distinguished speakers and young leaders from all over the world to enable lasting connections and create positive change. From the Prime Minister to Emma Watson, this high-profile event offered the singular opportunity for youths to not only be exposed to worldly movers and shakers, but also to put forward their own ideas about how they can generate change. One of the University’s own, Midia Shikh Hassan was present on the floor of this illustrious event to show her work within the Faculty of Engineering. After being heavily involved over the last few years, Midia is likely not an unfamiliar face to other students. This fourth-year student has developed an impressive list of accomplishments during her undergraduate years at the Faculty, yet she would rather let her work speak for itself. It is no secret that the Faculty continually strives to enforce the importance of putting ideas and knowledge into practice through extracurricular involvement, but Midia has gone beyond this principle by having an impact on the student body and the community. Just last year, at the Entrepreneurial Idea Competition, Midia, along with teammate Richard Appiah-Kubi, took third place for the app called “LetUsLearn.” This competition pushes students to develop an idea that could become a start-up or a make a difference in the community. The LetUsLearn app is a rehabilitative and education platform designed for kids with Autism Spectrum Disorders. It features modules developed by a multidisciplinary team of therapists, along with customized programs of treatment and support for parents. This innovative idea proved successful again at the Entrepreneurial Concepts Competition (EC-PEI) where the app was awarded the sum of $2 000. But it’s her latest project that is set to have the biggest impact yet. As program coordinator, Midia is a key player in the Difference Makers, an initiative that offers students the opportunity to identify and act upon their vision for creating positive change. Through a wide range of extracurricular activities and workshops, students have the opportunity to develop creative, problem-solving skills. This past summer, the group initiated an outreach program to welcome local Syrian refugees, expecting a modest response. To their amazement, 300 newly arrived refugees accepted their invitation. Yet the scope of the impact that the Difference Makers seek to have extends beyond the Ottawa region. In late October, at the Ontario Makers and Mentors Innovation Conference, Midia competed in the Senior Innovative Design Competition alongside teammates Antoine Machaalani and Olivier Miguel. 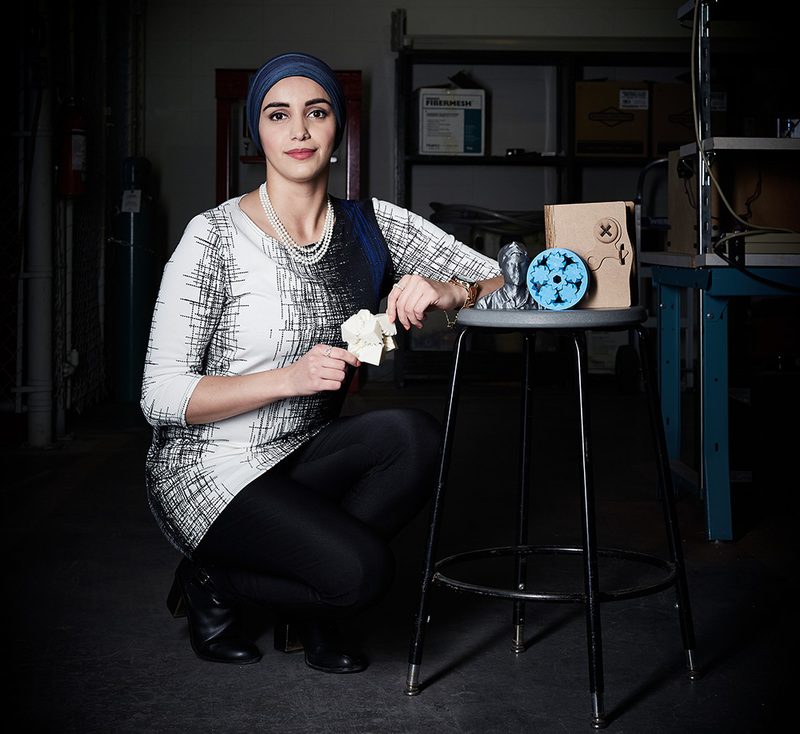 Their first-place-winning project, Dextra, is an initiative geared toward providing prosthetics to refugees living with upper-body amputations. Using cost-effective methods, Dextra aims to furnish 3D printed prosthetics to approximately 60 000 affected Syrian refugees residing in Lebanon. Their ultimate mission is to empower and improve the quality of life of those living with the loss of a limb. While this initiative is still in its formative stages, Midia and her partners’ simple idea is set to have a huge impact on thousands of people.